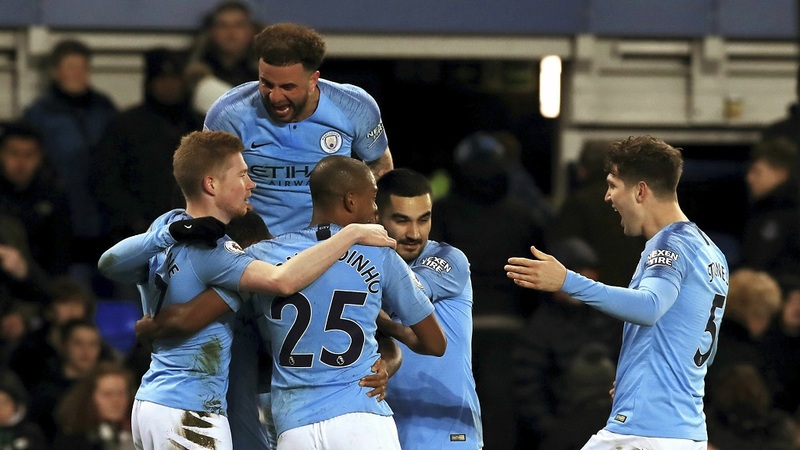 Manchester City's Gabriel Jesus, obscured, celebrates with teammates after scoring his side's second goal of the game against Everton during an English Premier League football match at Goodison Park, Liverpool, England, Wednesday, Feb. 6, 2019. 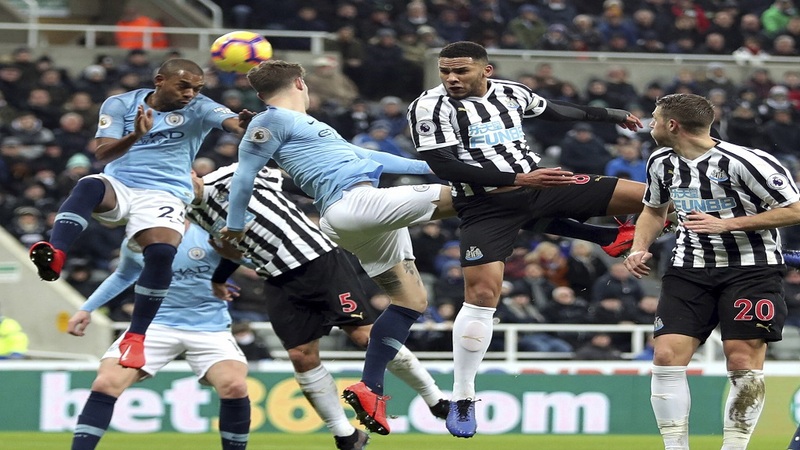 Manchester City climbed atop the Premier League standings — at least provisionally — for the first time since December by beating Everton 2-0 on Wednesday, heaping more pressure on main title rival Liverpool. Aymeric Laporte and Gabriel Jesus scored for City during injury time in either half as the hosts went above Liverpool on goal difference — although Juergen Klopp's team has a game in hand. 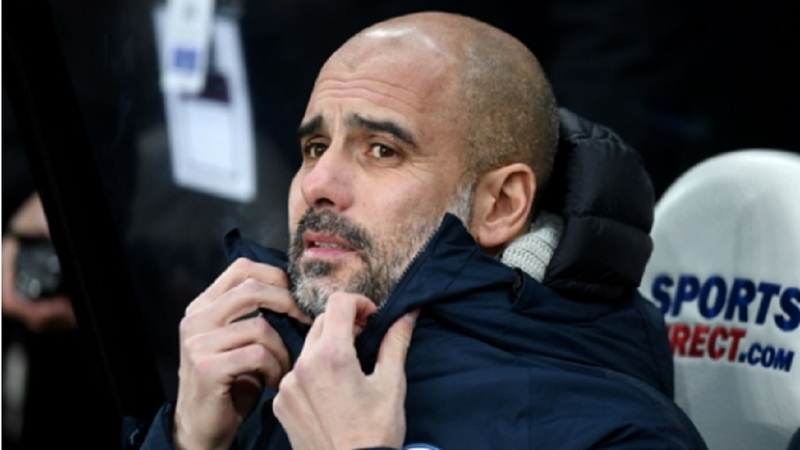 City's game at Everton, the only Premier League game played Wednesday, was rescheduled because of the English League Cup final on Feb. 24, when Pep Guardiola's team faces Chelsea at Wembley. City trailed Liverpool by seven points at the start of the year but beat Klopp's side on Jan. 3 and are now level with the Reds on 62 points, five points ahead of third-place Tottenham. The visitors struggled to create chances at Goodison Park but Laporte exploited Everton's weakness on set pieces by heading in the opening goal on the stroke of halftime, with City's first shot on target. It was the 12th Premier League goal — and 17th in all competitions — conceded from a set piece by Everton, the worst record in the top flight. Under-pressure manager Marco Silva opted for a defensive-minded lineup by leaving out leading scorers Richarlison and Gylfi Sigurdsson — who have scored 19 of Everton's 36 league goals this season —which made the team difficult for City to break down in the first half. 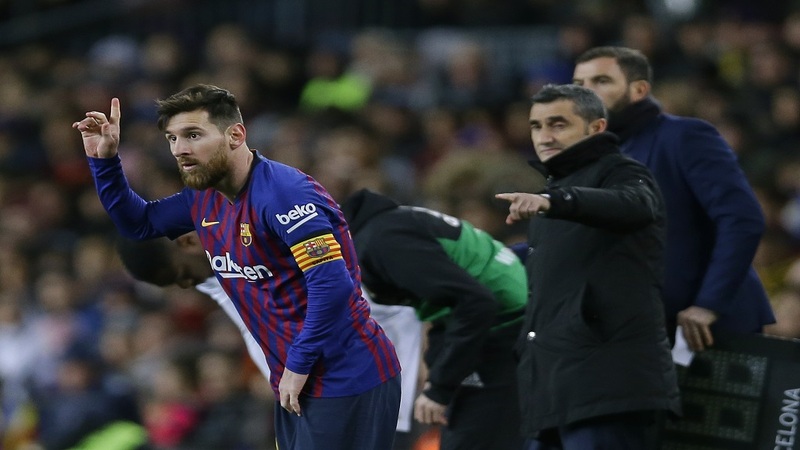 However, Ilkay Gundogan also had a shot deflected onto the crossbar and also had claims for a penalty waved away after a challenge by Andre Gomes. Sergio Aguero's 58th-minute overhead kick could have sealed the win but it flashed wide. Everton brought on Sigurdsson and Richarlison in search for an equalizer but instead it was Jesus who doubled the advantage with a header with virtually the last touch of the game.